Ralph started in athletics with St Stephen’s Harriers and was initially a runner by first choice. It was only as a result of a fallen arch in one foot (from running ½ mile and 1 mile races) that he turned to walking and was immediately successful. Starting in C grade, he quickly moved to A grade. He remained a member of the St Stephen’s A grade team until 1962 – a timespan of 27 years. He was also a keen member of VAWC and was one of the many members who helped at the working bees involved in the construction of the Alf Robinson Clubrooms. He worked alongside Jim Gaylor in cleaning bricks. For many years, Ralph and his wife provided the annual race numbers for VAAA, thus providing valuable club funds for VAWC. This was a huge annual job that involved producing thousands of numbers. Initially other members helped but eventually it was left to Ralph to do it alone. In the early sixties he volunteered to help Alan Hancock in producing the ‘Heel and Toe’ magazine. Ralph provided the paper and printed the headings while Alan did the editorial work. Ralph was awarded life membership of the club in 1964 in recognition of his many services to the club. 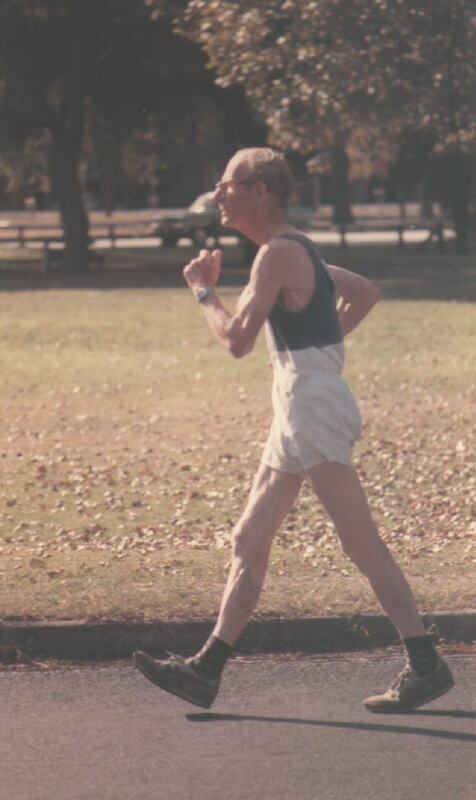 He continued to compete in VAWC club races each week throughout the sixties and seventies and was a regular towards the back of the pack walking with Jim Short. A hip replacment in the late 1980’s gave him a new lease of life and he still maintains an interest in the club. He will turn 88 years of age later this year.